My dressing room and closet is in a walk-in bank vault! My husband, Gary, and I live in a very small town in Southeast Oklahoma and make our home in the Old Rock Bank & Post Office building in downtown Broken Bow. The original walk-in vault, including the huge door, was in excellent condition when I started remodeling the 4,500 sq. ft. building. One of my first priorities was the vault. Add paint, wallpaper, carpet, dressing table, shelves, racks and PRESTO... I have a great dressing room and closet, full of my favorite treasures. I'm a "Baby-Boomer" and I am now in my 6th decade of living! I really don't care for the saying, "Grow old gracefully." I like the part that says "gracefully", but not the... "grow old." I believe, though our bodies are continually changing, "old" is a state of mind. I never want to grow old. Let me encourage you to always be graceful, but never grow old! Many of the Secrets from the Closet will reflect my philosophy of youth, no matter what your physical age may be. Fashion and beauty tips have always been interesting to me. In the early 1970's I attended John Robert Powers School of Modeling and, for a short time modeled for The Peggy Taylor Talent Agency, both in Dallas, Texas. Life choices took me in different career direction with a wonderful marriage to Gary Lanier and over 40 years as wife, mother, business owner, and co-worker in Christian ministry. After all these years, I am returning to my beauty interests and sharing with you some of the treasures I have learned! I'm going to take you inside my bank vault closet, unwrap the treasures hidden inside, and share with you Secrets from the Closet! In time there will be many BEAUTY TIP categories to choose from, with some including: FASHION, SKIN, MAKE-UP, HAIR and YOUR CLOSET. Simply click the links below, for a FREE DOWNLOAD! What Style, for What Age? certain style? Click the link above for some answers! Beautiful legs in the summertime... every girls dream! how to turn it into SUMMERTIME FUN! 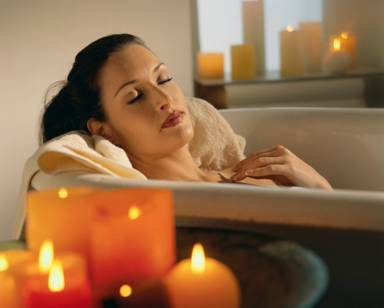 no matter what your age… it’s what I call THE BEAUTY BATH. years off the appearance of your skin! More "SECRETS FROM THE CLOSET" coming soon! © Copyright 2009-2014 by Valleta Lanier. All rights reserved.